Blake Starwater and the Adventures of the Starship Perilous #3. While the crew of the Perilous looks to fill some of the missing roles aboard the ship, they receive a job which sends them to a distant, mostly unexplored world. A vessel attempting to implement First Contact protocols with a newly-discovered species has gone silent. The fate of its crew is uncertain. Blake and the others are tasked with finding the missing ship and its crew. Will the job prove a cakewalk, or will there be a lot more running involved? 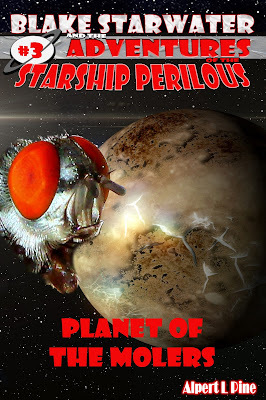 Blake Starwater and the Adventures of the Starship Perilous: Adventure #3.